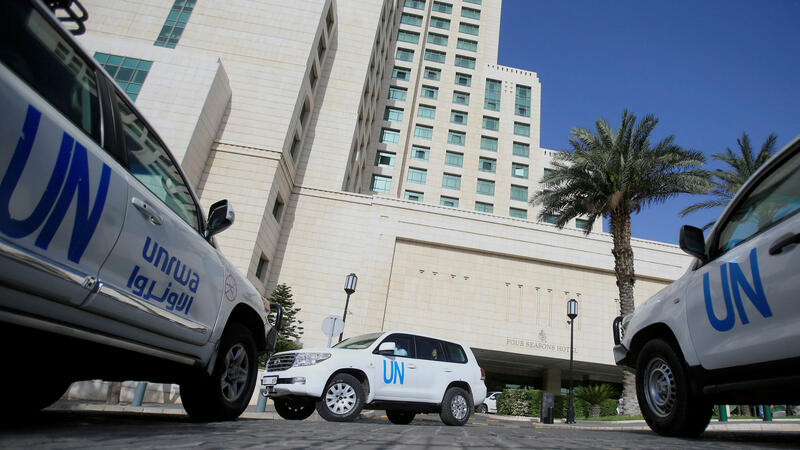 Inspectors from the Organisation for the Prohibition of Chemical Weapons have remained stuck in Damascus for nearly a week. 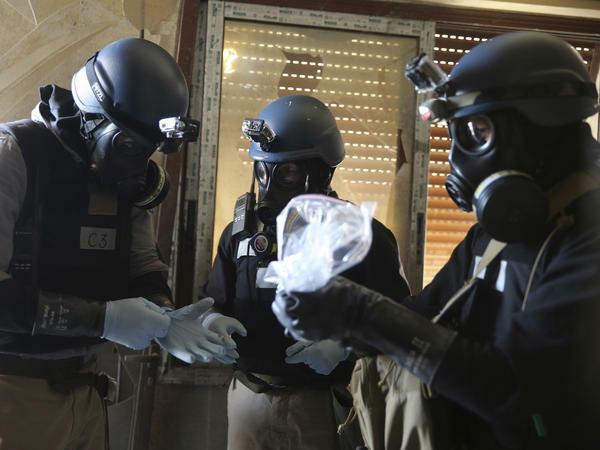 In 2013, chemical weapons inspectors working in the suburbs outside of Damascus were able to confirm the use of the nerve agent sarin. But so far the inspectors have been unable to reach the location of the attack to verify the facts for themselves. A United Nations reconnaissance team that visited the area on Tuesday came under fire and was forced to turn back. For now, the inspectors are sitting in their hotel rooms, waiting. "There's nothing they can do. They can't force their way in," says Dieter Rothbacher, a former chemical weapons inspector. The team wants to gather the evidence while it's fresh, he says. "Every day that passes the pressure gets bigger." The inspectors were sent by the Organisation for the Prohibition of Chemical Weapons in The Hague. The OPCW is responsible for overseeing the Chemical Weapons Convention — a 1997 treaty banning the production, stockpiling and use of such weapons. Syria signed up to the convention in 2013 after a chemical attack in another Damascus suburb left hundreds dead. Even though the Syrian government is legally obligated by the convention, the inspectors have limited powers, says Jerry Smith, another former inspector who worked in Syria in 2013 and 2014. "The OPCW is not the world police," he says. In an email, an OPCW spokesperson declined to comment on when the nine-person investigation team would be able to enter Douma: "We are unable to share operational details about this deployment. This policy exists to preserve the integrity of the investigatory process and its results as well as to ensure the safety and security of OPCW experts and personnel involved." Smith says during his time in Syria, he operated under the watchful eye of the government of Syrian President Bashar Assad. He believes security forces were keeping close tabs on his every move. "I'm sure we were being listened to: our phone calls monitored and our computers hacked and our rooms bugged," he says. Smith went to Syria shortly after the government joined the Chemical Weapons Convention to avert U.S. strikes and appease its chief patron, Russia. He helped to destroy some 1,300 metric tons of declared chemical weapons and their precursors. Although Syrian government officials generally seemed happy to help the OPCW team, things would sometimes get tense. "Some of the visits, the inspectors had weapons pointed at them," Smith says. This time around, Syria invited the OPCW inspectors in to investigate the Douma attack. The invitation provided the inspectors with the legal basis to enter Syria, but it gives the Syrian government the ability to control their activities. That makes the work of inspectors dramatically different from that of law enforcement. "In a police investigation, 99 percent of the stakeholders of that investigation want the truth to be found out," Smith says. But in the case of the latest attack, a chief suspect is the same government that's hosting the team. Already the delays will make it difficult to determine what happened in Douma. Analysts and local rescue and medical workers who observed victims have suggested chlorine was used. Chlorine is a highly volatile compound that evaporates quickly, says Rothbacher. "The best places to sample now are the people who have supposedly been hit," he says. But Syrian government officials will most likely determine whom inspectors talk to and what they see. Even if the inspectors can gather evidence, they won't be able to point the finger at anyone. "The inspectors are basically there to collect facts," says Ralf Trapp, a chemical weapons expert who has worked closely with the OPCW. "The question [of] whether there was a violation of the chemical weapons convention, that's a political question. That's not really their job." The political process for ascribing blame is broken, Trapp adds. A U.N. system for investigating chemical weapons violations in Syria broke down last October, after Russia, a close ally of Syria, vetoed its renewal. Without that political process, whatever facts the team can collect are likely to be spun by all sides in the conflict. "Whatever they do will be imperfect; whatever they do will be criticized," says Smith. But the inspectors can do something few others can. The team is made up of scientists, medical experts and engineers from all over the world. Their work is careful and methodical, and they may be able to provide something sorely lacking: impartial data concerning the events in Douma. "If you're lucky with the science, the science will quite conclusively disprove some of the stories," Smith says. But, he adds, "It's a kind of a slow process."